Discussion in 'Henshin Justice Unlimited' started by SamuraiEchidna, Mar 29, 2019. There's only you and me, and we just disagree~! Welcome to the discussion thread for Kamen Rider Zi-O, episode 28; "Our Goal 2019". 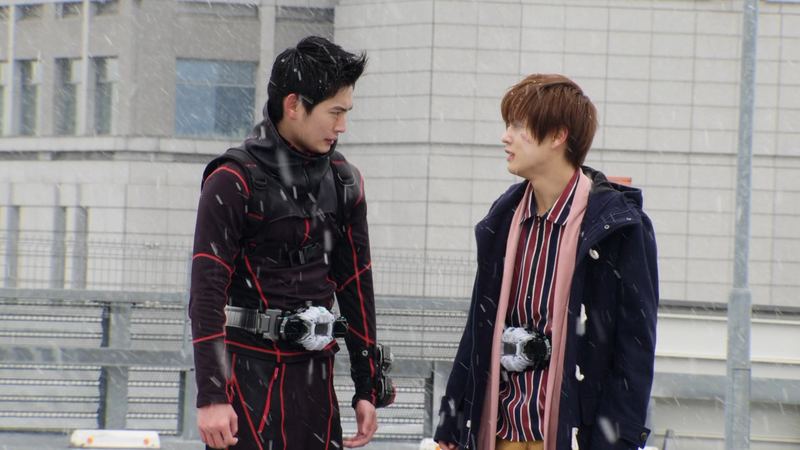 This week: Hiryū and Black Woz, as Kamen Rider Woz, confront Sougo and Geiz, respectively. The two riders however, are determined to overcome all obstacles and confront each other in their destined fight. Episode 29 hype! Diend, Blade and Chalice return!!!! Well that fight in the middle was cool. In this era where form changes and finishign moves are all so CGI heavy, it's rare that Toei can afford to splurge on a single episode and have something like that. So Swartz and White Woz seem to be the real villains with their own endgame in mind. I guess it's nice that some plot is showing up at last. Aww, they made up! I'm so happy for Sougo and Geiz; I knew they would! And they did it with one of the most epic fight scenes in all of Zi-O! And I TOTALLY called it! And so did Geiz! We BOTH knew White Woz was up to something and could not be trusted. Can't trust Black Woz? Can't trust White Woz either. We see him collaborating with Swartz at the end, but I doubt that it's just between them. I bet this conspiracy goes even deeper. And I guess I was kind of wrong about Swartz creating a causality loop? Seems Sougo was always destined to become Zi-O and his temporal powers were always laying dormant. Swartz helped awaken it when Sougo was young, for a moment, but chances are it was going to eventually happen anyways. Finally, what I like best is how this is sort of, yet not really, becoming a 5 parter? Decade was here, but never part of the story, and DiEnd will be in the next episode. But the main story of this arc wrapped up here. The next episode (or two) will just be sweet bonus. And I definitely want to see those episodes, because I still want this show to explain how Decade fits into all this. I have my theories, but I'm holding back. Based on this episode, when Decade was in his prime (in the year 2009), Sougo was a kid discovering his dormant powers. Decade is thinking of destroying the world because Sougo poses a possible threat to it. That sort of fits with his character (at the least the being aloof part), but it doesn't fit the canon of Decade's show. Again, it's early for me to declare an actual hard retcon. I'm still confused about if Decade is actually time traveling or dimension hopping. This episode says time travel, but since his DecaDriver has been modified, that might mean that it is now made for time travel just like Zi-O's rider gear. I'm still confused about if Decade is actually time traveling or dimension hopping. This episode says time travel, but since his DecaDriver has been modified, that might mean that it is now made for time travel just like Zi-O's rider gear. It's confirmed through the earlier episodes such as the Decade and Ghost tribute episodes that Tsukasa is capable of BOTH dimensional travel like in his show and time travel as confirmed when he went back in time with Another Ghost. I don't think this is a retcon yet. Tsukasa could have just been on a side mission traveling to the World of Zi-O, while still doing what he was doing in his show. I feel the writers just wanted to tie-in more Heisei Riders into Zi-O since its an anniversary season. I expect a Decade and Zi-O team up fight down the line. Tsukasa have ability to time travel and this is same ability which allow him to travel to another Rider world. In one of Den-O Movie, Battleship Onigashima, he did time travel just to bring back Sieg to his own gang. In movie All Rider vs Daishocker, Tsukasa already have this power since his childhood, his driver only harness his power even further to use other Rider power. Retcon? They never have story from the start. In every world, Tsukasa have different role and background, just like Akaranger but with human actor. I liked the Episode. I also started the Rider Time: Ryuki episodes & they aren't half bad either. I don't know if this is the right place to talk about them, but I'll try to be spoiler free. So, I guess there's going to be multiple episodes per Rider, but I am a little confused. I thought Shinobi's was going to drop first. Multiverse and Time Travel are not the same. I know sometimes these genres can cross into each other, but they're not the same. And I am not convinced Decade had time travel abilities in his own TV show. If he did, he would have been able to solve a lot of his troubles before they got out of hand, and he would have been able to find out the mysteries of his origins faster. As for Battleship Onigashima, that was not the same Den-O from the TV series. That was a Den-O from a parallel world; it was just coincidence that parallel version was VERY similar to canon Den-O. That's the risk of traveling the multiverse; sometimes you run into a parallel that is EXTREMELY similar to the original, other times you run into a parallel that is wildly different. Don't worry. When and if any of the Rider Time specials are subbed, I'll make a discussion thread for it. I am sure TV-Nihon will do it, but I am giving Over-Time the time they need. I believe they said they would sub it eventually on their own website. Well, this Parallel Den-O did time travel and Decade still can follow them. In the end of episode Den-O World, Sieg became hint that this Movie is continuation from Decade Series crossover with Den-O. In Ghost tribute in Zi-O series, Tsukasa told Aura that going to the past is like cross to the world of past for him. I guess he can imitate anyone power as long as he still staying inside their world. Like when he just jump to mirror world when he is in Ryuki World, but in the next world he need to transform to Ryuki Form to do that. In this episode, my big question is, what happened to Shougo parent? There is no way Tsukasa just save Tsukoyomi but not them, right? It just not feel right. I didn't even pay attention to that! We could even make an argument that Tsukasa could have saved everybody on that bus. Damn you Decade! As for Battleship Onigashima, that was not the same Den-O from the TV series. That was a Den-O from a parallel world; it was just coincidence that parallel version was VERY similar to canon Den-O. It may not be the same version from the original TV series, but it is quite explicitly still the same version of Den-O that appeared in two episodes of the Decade TV series. The characters in the movie directly reference the events of the episodes. In the TV series they met up with that version of Den-O in the (then) present day. In the movie that Den-O crew travel back in time in the DenLiner only to encounter the Decade crew twice more while in the past. The first time Decade traveled there via photography studio and Natsumi also appears. The second time he just appears through a 'grey wall' portal - which I believe is actually the very first time we see him using one. I suppose you could make the argument that it's the photography studio that can also travel in time and maybe Decade just used the portal to travel between two locations within that same dimension. But that still means that Decade has a method of time travel at his disposal, as there's never been any confirmation as to how he is still traveling nowadays. Or perhaps this is indeed an earlier version of Decade from 2009, long before he returned to this world for the previous four episodes we saw? Or maybe, just maybe, we're all putting more thought into it than the writer of the episode did? Everyone make a fuss about moral of episode when they thought Tsukoyomi really did shoot at children in previous episode. But rarely to speak of this , when rider casually make victim out of necessary. Like when Build toss soldier from the wall in episode 1 or when Kachidoki blow up soldier from Yggdrasil tower. I thought this is the reason why Tsukasa must be in that bus. To stop unnecessary victim. There is should be more children survived, before the newspaper stated that only 2 survivor from that accident too but here we see there is more than Shougo and Hiryuu survived. But still when Swartz send them back to present, there is only two of them. What happened to the rest of children? I hope this is his trump card when Tsukasa stop Shougo from becoming Oma Zi-O. His own parent. LOL. I hope that is not true. I don't want to experience the same thing like what happened to Decade. I hope they really thinking how to end this series wonderfully. I understand that, and I need to rewatch some things to get all the details straight. I have a theory about all that, but it's been a while since I watched Battleship Onigashima. I need to know all the facts before I can truly explain everything. Decade was a mess of a crossover event. Not entirely unexplainable, but still a hot mess. I've been thinking of doing my own retrospective on Decade some day. Not so much for review purposes, but for making Decade understandable to anyone who got confused by it and explaining the nuances/little details as well. I still have doubts that Tsukasa/Decade had any time travel back then, but if he did, then I doubt Tsukasa/Decade actually had control over those powers. That was kind of the point of the show; not only did he lose his memory, but he lost the ability to fully control his multiverse traveling powers. That's why he had to wait for that curtain/mural to decide his next destination, and it was always random. It's still a reflection of his own powers, he just couldn't control them. And if my theory is correct, his current pink DecaDriver (which may be a modified version of his old DecaDriver) reflects how he can now control those powers at will as well as time travel. ...Wow! I genuinely didn't think of that til just now. Unless the show decides to surprise us and reveal they were alive all along, then this really was a genuine "Onore, Decade!" moment!